Author’s note: Since this post was written, the API of postMessage has changed slightly. When sending a SharedArrayBuffer with postMessage, the buffer should no longer be in the transfer list argument of the postMessage call. 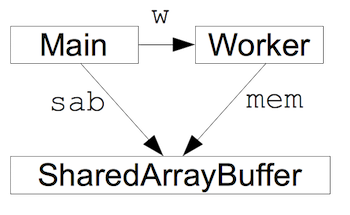 Thus, if sab is a SharedArrayBuffer object and w is a worker, w.postMessage(sab) sends the buffer to the worker. You can visit MDN’s SharedArrayBuffer documentation for more detail. 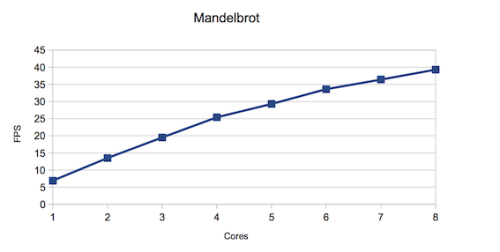 Excellent article … even so, the program speeds up almost look briefly at the Mandelbrot code on the cores that program standards body. I’m not sure if anything can be done about that. This is also my first introduction to Atomics. Thanks for the write-up! In Firefox 46 or later (not Chrome) you can create a new tab, and in the address field of that tab you type in “about:config”. You may have to click through a warning page after that. On the page that contains all the options that you then come to, enter “shared_memory” into the search field, and it will find this option. Double-click the option to change its value from false to true. One small thing regarding the “Speed and responsiveness” that could be a little bit incomplete: we already have a way today to transfer binary data with postMessage in a “no copy” way (based on ownership) thanks to Transferable. Yes, transfering works to avoid copying in some cases. But the program often has to be restructured radically to make that work, whereas with shared memory the program can more often retain (more of) its original shape. More important is that there are many patterns of memory access that are possible with shared memory but not with transfering, typically, where multiple workers use the same input data to produce individual slices of the output. With transfering, no sharing is possible. Another case is when data are processed first by row, then by column. We could use transfering to split a grid by rows and transfer the rows to workers, but to split by columns and then transfer columns later we’d need to make a copy of the grid. 1. How is the accidental modification of random JS objects from multiple threads prevented – that is, how is the communication restricted to explicitly shared memory? Is it done by using OS process underneath? There do exist tasks which can be handled more efficiently using raw atomics than using a Cilk-like interface, but in my experience they are the exception rather than the rule; on the other hand parallelism bugs are the rule rather than the exception, and so effective automated debugging tools are a godsend. Cilk comes with great race detection tools and these can be developed for any system with a similar interface; the thing enabling this is that a Cilk program’s task dependency graph is a fork-join graph, whereas with atomics it’s a generic DAG and the number of task orderings an automated debugging tool has to try with a DAG is potentially very large, whereas with a fork-join graph it’s always just two orderings. I wrote about it here http://yosefk.com/blog/checkedthreads-bug-free-shared-memory-parallelism.html – my point though isn’t to plug my own Cilk knock-off that I present in that post but to elaborate on the benefits of a Cilk-like interface relatively to raw atomics. The protection against accidental modification of “random” JS objects is that you can only share the memory of a SharedArrayBuffer. No other JS objects in one agent can be modified by another agent. And of course, modifications to the memory of a SharedArrayBuffer is range checked, so you can’t scribble outside that memory. There is indeed a specific rationale for exposing this very low level API. We see it as both a substrate for building higher-level abstractions for JS one the one hand (for example, one of the first things I built was a data-parallel framework) and as a compilation target for C/C++ (as part of asm.js) on the other hand. The current API is somewhat of a compromise between the needs of the two use cases. My CPU gets warmer too, when I run this example on all the available cores; this is certainly expected… Hard to say more than that without knowing more about the problem you’re seeing. Heat is the only problem. example running correctly. I was going to point out the same thing as Prem did. Heat is a problem without a doubt..
Clearly when you’re computing 100% on all cores the chip will be drawing a lot of power and generating heat, but it’s designed for that. Is there something beyond that that is a concern? Strange to see feedback complaining about CPU getting hot. One way to describe this feature is that it is designed to allow you to maximise the temperature! That is what computation does. Yeah! Deadlocks and semaphores in browser! – Not being able to block on the main thread ensures that the browser does not lock up. – Again, using frameworks for common patterns of parallelism will reduce the chance of cutting yourself. I’ve built some simple frameworks myself but this is where I’d expect to see the JS community do some good work. For those who find this sort of thing interesting and want to experiment now, Extended Memory Semantics (https://github.com/SyntheticSemantics/ems and https://www.npmjs.com/package/ems) adds shared memory parallelism to Node.js, works on JSON objects not just integers, supports persistence, transactions, and other shared memory parallel programming capabilities. eagerly waiting to be shipped in browsers. Very useful for optimise and move expansive task to worker via shared memory. Excellent article. waiting to be shipped in browsers. Thanks, that looks helpful. Even though browser support is not the best, still a huge improvement in the browsers it is available in. Shared memory is definitely a step in the right direction. I would like to see support for shared objects (i.e. JSON) for increased ease of use. While sharing arrays of numbers is nice for straight forward numerical computation, I can see it being awkward for some more complex cases (where you’d come up with object-SharedArrayBuffer serialisation/deserialisation — in which case you may as well just copy). I’ll be adding SharedArrayBuffer support to Weaver.js (http://weaver.js.org). The ems project looks like it could be useful on the Node.js side — thanks for the link, Jace. More elaborate object systems will need object management – reference counting or garbage collection, not an easy problem to solve in user code and something that will really need proper built-in support. The dream would be for JS to gain a specific built-in concept of a “record” (an immutable object), which is only able to reference other records and primitives, so that a tree of records can be shared between workers.